I'm so enamored of this whole MOOC thing... I've completed three classes so far and am currently taking far more than anyone should at one time. I may, if I feel so inclined, blog a bit about the classes I have taken and am currently taking. If anyone has any interest at all. There's some guy who is trying to complete the MOOC equivalent of a Bachelor's degree in a year. He's set that as something like 35-40 courses. Meanwhile- I've also been enjoying loads of random meetups (through Meetup.com)- including a book club, a cocktail-bar-exploration club, a parent group, a film group, and other stuff I randomly end up at. I keep missing brunch club- which is unfortunate because- hey- I *really* like brunch. petitions- I'm suspending my petition campaign for now. More on this later...when I have a bit more time. For perspective- when the AQI hits 200-250, the international schools (such as the Canadian School, the British School, the German School, etc) keep the kids inside all day- no outdoor PE or recess. On one of the days last week when Beijing was above 700, the AQI in New York City was 16. So...we are back in the US... completely against my will- I was planning at least another couple of years in China... but China wanted us no longer. They changed their visa policies and we got stuck in the morass that is the Chinese visa bureaucracy and, well, we're back in Nola. Leo has grown...quite a bit... he's not begging to go hang out with "babies" anymore- now he's a big little boy who has just started preschool at St. Joseph's Mothers Day Out. He got in trouble - put in timeout- for "playing rough with friends and not stopping when the teacher told him to"
I asked him about it- thinking he might have been pushing another kid or something- and he told me "NO! Bentley and me played cars!" I asked if he pulled a toy away or was not sharing and he responded again "No! We *crash* cars!" Meanwhile, at home, he tends to tell us forcefully what he thinks we should be wanting to do. "Mama- You WANT to play trains." "Mama- You WANT to play with the police car. I want to play with the race car." His language ability has just skyrocketed in the last 6 months or so...although I'm afraid he will lose most of his Chinese. We practice Chinese every few days- singing a song or naming colors or such. I'm obviously too far behind on my blogging to reasonably update anyone on anything. So...I'll just share the randomness of my life as of late. Yesterday, as we were walking from one store to another (because the first store was completely overrun with people starting their Chinese New Year shopping and we didn't feel like waiting in the checkout line for upwards of 2 hours, so we decided to go to a different store)... a dapper elderly fellow with a cane wandered out of his old Communist-era apartment complex gate and spotted us as he came onto the sidewalk. He was in the midst of humming a tune and suddenly burst into song. "Lao wai! Laaaoooo waiii!" he sang. In Chinese, this is basically "Foreigner! Fooorreeiiggnnerrrr!" Thus is life in China. *clothing is hung to dry outside here- no one here has clothes dryers and the girls at the "massage parlor"(ie brothel) next to the trees apparently had no clothing line. It has been forever since I posted on LJ! Wow! Motherhood and work have totally thrown my blogging off the rails! China. Writing. New Orleans and Mardi Gras. China. Seoul. China. Writing. Toddler Group. Pusan. China. Random Toddler Stuff. Writing. China. Pusan, South Korea is amazing. I really enjoyed our trip there and recommend it to absolutely anyone. Lovely city, beaches, cliffside temples, scenery, etc. The food was great, the people friendly. Simply a lovely place to vacation. I like Seoul, too- always love visiting there- but Seoul is already on many people's radar- nobody ever thinks "Hey, let's go to Pusan for vacation"- but they SHOULD. So, we've been meeting up at those kinds of places all summer, and also at friends' homes. We also went swimming one week in June at the pool at Chaoyang park, which Leo loved! I'm bummed because they are closed already, though. It's still HOT! Pools should remain open until the last possible warm day when people (read- ME) might want to go swimming. Otherwise, I feel guilty that we didn't take advantage of the pool and bring Leo more often over the summer. 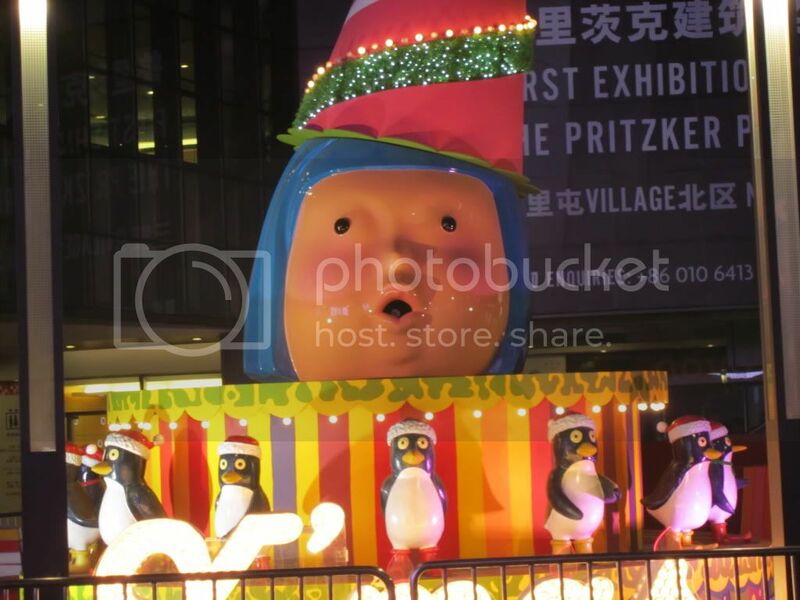 Christmas in China is an...um...interesting affair. Sometimes, I'm mildly confused by what they come up with here in terms of decorations. In another sense, I am highly entertained by the sheer enthusiasm shown by their attempts. As I'm doing research for the random articles I write to support my "being a mother" and "doing stuff I want" habits, I occasionally come across other random articles or scientific research that blows my mind. "Change in Human Social Behavior in Response to a Common Vaccine" from the Annals of Epidemiology. Basically, the take-home is that when a virus- specifically the flu virus- infects us, we humans change our behavior. We become more social, hanging out with more people in larger groups, for the 48 hours immediately after infection. Before symptoms show up. And, conveniently, a great time for that friendly virus to spread to others in the community. I've often bored people to death with talked about toxoplasmosis and its effect on the rats that catch it. Basically, for those who DON'T know this story- toxoplasmosis is a parasite that infects rats and gets carried by cats. When it infects a rat, it changes the rat's brain and behavior- making the rat temporarily braver and more curious- which makes it more likely to get eaten by a cat. The cat will then carry the disease to the next area it visits, where it will expel the parasite in its feces, to get eaten by rats, who will become braver... you probably see where this is going. Up til now, I was unaware of any infectious diseases altering the brains and behavior of humans. But apparently, the flu appears to do so. The temperature outside was 23 degrees Celsius (about 73 F). The temperature inside our apartment was 24 degrees Celsius(about 75 F). After temps in the 30s all week, this was decidedly cooler than it had been for a while. We walked outside with the baby, wrapped in his Moby-like-wrap, for a quick trip to the store a few blocks away. His legs hang down from the wrap and he's got no socks on. As we leave the apartment building, I remark to Justin "I wonder how long it will be before someone..."
A Chinese girl interrupts me. "Excuse me. Isn't your baby cold?" She touches his little feet as he beams up at her. Justin says. "About two seconds."